Today was the Monday-est of Mondays, so we all ate our favorites from the fridge today. This is my bowl… all the side dishes and roasted vegetables made yesterday. In fact one of my favorite parts of cooking on Sundays is knowing that we will have extra for dinner the next day. 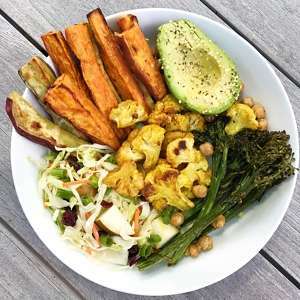 Roasted Sweet Potatoes, Roasted Turmeric Cauliflower, Roasted Broccolini, Roasted Chickpeas, a Fall Cabbage Slaw and Avocado for good measure. Because is there anything better than creamy avocado with roasted veggies? A big bowl full of ideas for Fall side dishes. Fall Cabbage Slaw recipe adapted from a friend. In a large bowl cabbage, pears, scallions and cranberries. In small bowl whisk together dressing --rice vinegar, lime juice, and oil. Mix the cabbage and the dressing. Let it stand at room temp. for 30 minutes before serving. Sweet Potato Fries: Gently toss in avocado oil. Lay in a single layer on an individual baking sheet and bake 30-40 minutes or until tender and crispy. The baking time varies on thickness of fries. Chickpeas: Gently toss in oil, salt, pepper and sprinkle with turmeric if desired. Place in a single layer on baking sheet and bake 15 minutes or until just crispy.